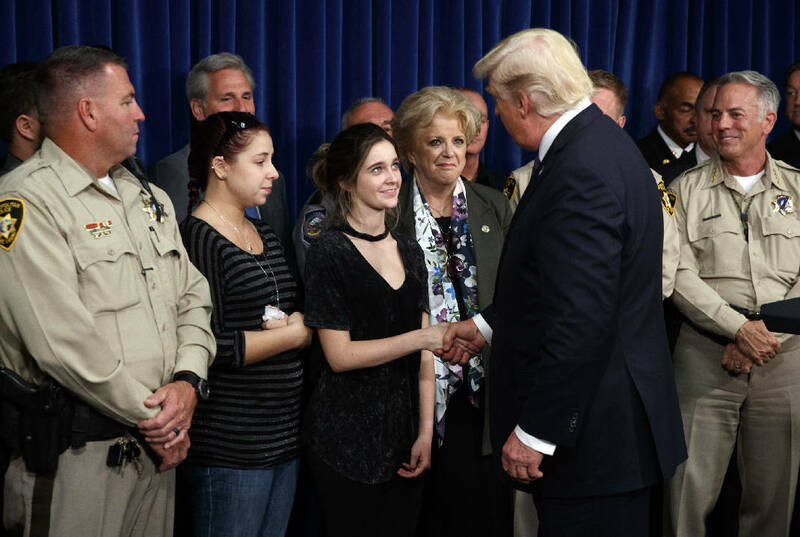 LAS VEGAS (AP) — Solemn in the face of tragedy, President Donald Trump visited hospital bedsides and a vital police base in stricken Las Vegas, offering prayers and condolences to the victims of Sunday night's shooting massacre. The president also singled out for praise the first responders and doctors who rushed to save lives, saying "America is truly a nation in mourning." His appearance in the city came just days after a gunman holed up on the 32nd floor of a hotel and casino opened fire on a crowd at an outdoor country music festival below. At least 58 people were killed and more than 500 were injured from the gunfire and the chaotic situation as concert-goers tried to flee. Trump at one point spoke of families who "tonight will go to bed in a world that is suddenly empty." "Our souls are stricken with grief for every American who lost a husband or a wife, a mother or a father, a son or a daughter," he told them. "We know that your sorrow feels endless. We stand together to help you carry your pain." It was a somber address from a provocateur president who prides himself on commanding strength but occasionally has struggled to project empathy in times of tragedy. Trump's solemn words in Las Vegas offered a sharp contrast to his trip a day earlier to hurricane-ravaged Puerto Rico, where he spoke of the "expensive" recovery effort on the island and noted the relatively low death toll there compared with "a real catastrophe like Katrina" in 2005. Trump also described a military veteran who had rushed to the scene in search of loved ones, but quickly turned to helping victims, using plastic barriers as gurneys for the injured and frantically searching for anything he could use to make splints. His first stop was the University Medical Center, where he spent over 90 minutes visiting with recovering victims, some with severe injuries, and listening to their stories. While a serious visit, White House spokeswoman Sarah Huckabee Sanders said there was laughter and celebration in some of the visits with some of the families affected by the shooting. Trump also met with about 100 medical professionals. Sanders said the visit was a moving experience for the president, who lingered at the hospital longer than planned. He said after the visit that he'd met "some of the most amazing people" and invited them to visit the White House. Trump did not visit the site of the shooting, but on his trip from the airport, his motorcade drove past the Mandalay Bay hotel where the gunman carried the shooting rampage.